The very next morning the Cork Examiner had a very different story on its front page. Mr. Aubrey McElhatton of Irish Continental Line described the previous days Ministerial announcement as “unfortunate and premature”. In fact Mr, McElhatton said that they had not even discussed it at board level. Irish Continental did not become involved. In 1987 three local authorities in Ireland, Cork Corporation, Cork County Council and Kerry County Council, together with West Glamorgan County Council and Swansea City Council co-operated to form a new company Swansea Cork Car Ferries Limited, and the Celtic Pride arrived at Ringaskiddy on 13th April 1987.
â€œThis is the finest ferry available anywhere,” said Mr. James McMahon, the new Company’s first Managing Director. Facilities would include a swimming pool, sauna, casino, a chamber orchestra, hairdressing salon, children’s playroom, a nursery as well as restaurants, duty free facilities, bars and the services of a resident doctor and nurse would be available on the ferry. Initially there were language difficulties, as was only to be expected. The service proved exceptionally popular with the people of South Wales and Cork and Kerry but one shortcoming proved hard to overcome. The ferry had quite small and restricted vehicle decks and had a nominal capacity of 170 cars. With two car decks in full use freight could only be carried in minuscule quantities. Because of excellent relations with Brittany Ferries the Celtic Pride operated a mid-week return service to Roseoff for Brittany Ferries in addition to its South Wales sailings. The ferry proved popular with French motorists and passengers. 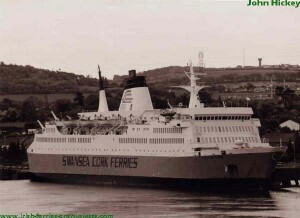 The coming of Swansea Cork Ferries provoked a savage price cutting war with the two established operators Sealink and B & I Line and accusations of Government subsidies and unfair advantages through using a non-EEC crew. There was also resentment over the fact that not many British or Irish nationals were being employed on the ferry; critics tended to gloss over the number of Welsh and Irish shore staff employed in offices on both sides of the sea and the employment of local dockworkers and the regional tourism benefits in both Wales and Ireland. 1988 was a repeat of the first season; again the Celtic Pride sailed to Swansea and Roscoff. The popular vessel had set standards of facilities on board, which meant that other companies were now obliged to provide similar standards. However there had been management troubles; Chief Executives had come and gone and the Company were anxious to secure a vessel with a larger car deck for 1989. The Irish Government had originally been supportive of the venture, but despite talk and promises of promises, certain guarantees of funding were too slow in materialising and so 1989 proved a blank year. No ferry, no service with the critics nodding wisely. “Told you so” was the chorus. The Directors were most anxious to prove the critics wrong. Accordingly visits were arranged to Greece and a management structure that was to he unique evolved. May 1990 saw the blue hulled Greek owned ferry Ionian Sun arrive at Ringaskiddy. The vessel was never officially renamed but traded as the Celtic Pride II. It had a familiar shape – it was in fact the former B & I car ferry Leinster built in Cork in 1968, renamed Innisfallen (5) in 1980, sold to Strintzis Line in 1986 and was now back within sight of its birthplace, Rushbrooke. Strintzis Lines had remodelled the ship’s interior; she now boasted many more cabins above the car decks, she had a better vehicle capacity and could carry more freight. Unfortunately it was not possible for Brittany Ferries to operate her to Roscoff given the lateness of her charter arrangements and the Ionian Sum trading as the Critic Pride II, only operated for the 1990 season for Swansea Cork Ferries. The very short season did not allow the Greek crew to acclimatise in the same way as the Polish crew on the original Celtic Pride and she failed to attain the popularity of her predecessor. Carryings for 1990 were good; indeed both afloat and ashore the demand was for the Company to operate a longer season; some went further and demanded an all-year service. The passage from Cork to Swansea occupied ten hours; the daylight crossing from Cork proved popular with passengers who were inclined to look upon the trip as a cruise. Night crossings from Swansea gave the chance of quite a lengthy rest in bed or with a Pullman seat and arrival at a sensible hour in the morning. Many passengers appreciated not having to leave the ferry at 3 a.m. In the ‘off season’ a strange thing happened. During a press conference being given by Sealink in Dublin a virulent attack was made on Swansea Cork Ferries and its continued existence. The rival operation suggested that Government funds, if there were any available, would he better employed building a super highway from Cork to Rosslare – this would ensure that ferries operating from the Wexford port would he more easily available to Cork and Kerry people. A spirited answer was given in the- Evening Echo of Cork. “Why” asked that paper “is Goliath worried about David?â€ The sight of the world’s leading ferry operator railing against a one ship operation did indeed justify the Goliath and David analogue. Indeed the ‘Echo’ reminded its readers that in a previous famous encounter Goliath had lost to David. The Celtic Pride (ex Rogtiliti) was reintroduced to Cork-Swansea with some style. The directors of the Company held a pre-sailing reception on board the ferry in Ringaskiddy on Friday 1st March 1991, and a large party of VIPs dined on board the crossing and, following an early morning arrival in Swansea, the ferry, having discharged, moved in through the entrance locks and moored in the non-tidal docks. On Saturday night (2nd March) civic representatives from Swansea attended a special dinner and reception on board. Lord Mayors, Council Chairmen and Government Ministers all combined to make it a very special occasion. And so the Celtic Pride settled down again sailing on the Inter-City route; but there was more to come as on Friday 15th March 1991 the Brittany Ferries route between Cork and Roscoff was reopened for the 1991 season; but it was not a French ship which restarted the route. The Celtic Pride was now to operate at weekends for Brittany Ferries until May when they sent their own ferry back in service. The 1991 season on the route between the Welsh and Irish cities proved to be a very good year. The Celtic Pride proved, a popular vessel and bookings held steady. In the autumn the Celtic Pride returned to the Roscoff-Cork run again at weekends and proved popular with Continental travellers. Following the seasonal ending of the Breton route, several functions were held on Saturday nights on the Celtic Pride in Swansea. Bad weather struck on the very last trip of the season when she could not leave Ringaskiddy until 01.00 hours on 31st October and did not arrive in Swansea until 14.40 hours, instead ot her scheduled 08.00 hours arrival. The crew and passengers had endured a very bad crossing indeed. The 1992 season commenced on Friday 6th March 1992. Once again the Celtic Pride was the ship to run the service and one-week after its initial voyage she sailed up the River Lee to Cork City where she berthed at the North Custom House Quay. Here Mr. Albert Reynolds T.D, the Taoiseach visited her . Many DÃ¡il members and local representatives were present and saw Mr. Reynolds unveil a plaque to mark his visit. Competition on southern routes was intense all season. B & I Line had just introduced the Isle of Innisfree on their Pembroke Dock to Rosslare route, Sena Sealink went, as usual, operating the Stena Felicity, so the Rosslare routes certainly held the edge as regards modern ships with very much larger capacity. Perhaps it was loyalty, perhaps stubbornness, but the Celtic Pride was still experiencing heavy bookings. Tragedy struck in August 1992 when two teenagers, a brother and sister, died in their cabin en route to Cork. They had been overcome by fumes, traced to an alteration that had been made to the venting system in a septic tank. It proved impossible to determine where and when the alteration had been made. So in 1993 another vessel arrived from Greece for the season. This was the Japanese built Superferry, which had been built in 1972 and originally was named the Cassiopeia for Ocean Ferry K.K. She became the IZU No. 3 in 1976 and was acquired by the Greek company in 1991 and following a brief period as the Ionian Star became the Superferry She had been extensively rebuilt before corning to Cork. Her tonnage now is 7,454 gross tons, and the passenger capacity is 1,355 with space for 550 cars. Prior to the Superferry coming to Ringaskiddy, Strintzis had spent a lot of money on putting in extra cabins, berths and Pullman seats and a new Irish pub, Paddy Murphy’s-had been installed. The Superferry took up service on time in March 1993. It has a much bigger capacity for vehicles, with two full width decks in contrast to its immediate predecessor. This extra capacity resulted in an immediate increase in freight carryings and the ship was given a longer season. She has proved a good sea-vessel and has extra speed to help in what is a very tight and demanding schedule. Services continued every year until early January when Superferry was returned to Greece for her annual overhaul and was sometimes used to relieve vessels on Strintzis’ Adriatic routes. 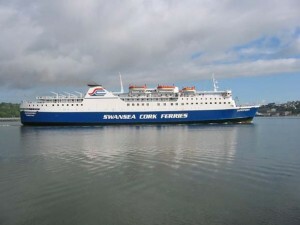 Early in 1999, Strinzis slod Swansea-Cork ferries at a profit to an Irish business consortium headed by Briar Star Ltd, headed by Dennis Murphy and Thomas Hunter McGowan. The Superferry was retained on charter and a second route was launched between Cork and St. Malo using an ex-DFDS North Sea ship Dana Hafnia, then the Cyprus flagged Venus. The service was advertised as Cork St. Malo Ferries and sailings continued erratically until November when Venus returned to Greece and only Superferry reappeared in 2000. 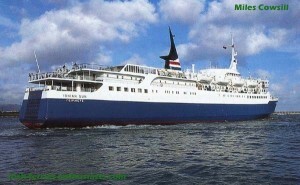 The Superferry remained in Mediterranean waters in 2001, resulting in the company chartering Hellenic Mediterranean Lines’ Egnatia IIwhich reopened the route as the City of Cork, a vessel well know in Irish waters for her services between Ireland and France for Irish Ferries as the Saint Patrick II. The City of Cork got off to a bad start with crew training and safety regulation compliance problems, and was returned to her owners at the start of November, her charter not being replaced in 2002. The company again turned to the Superferry, and Strinzis, then part of Superfast Ferries who used her during 2001 as the Blue Aegeanin Greek domestic traffic. The company restored her former name, and brought her “home” to Irish waters, when it emerged that Swansea-Cork were to become ship owners for the first time, reportedly buying the ship for 6.5million before her return in March 2002, when her sailing schedule was extended, as she no longer needed to visit Greece for her refit, and instead in 2001 went to Dublin. 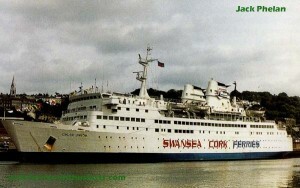 In July 2006 Swansea-Cork ferries announced the sale of the M/V Superferry. Her last service was on October 7th from Cork, and later that week she set sail for Egypt, where she now operates for Namma International as Mahabbha. 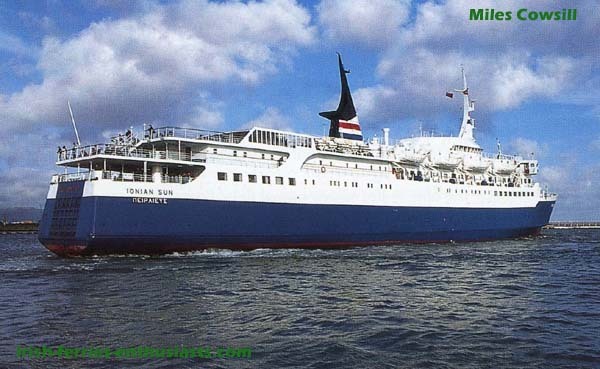 A replacement passenger vessel could not be found in time for the 2007 season, however HJ Lines, headed by a Welsh business man launched a short lived Ro-Ro service between the two ports using the 1980 built, Norwegian flagged Victoria, with sailings commencing in February. The service however only lasted two months and operations were wound up following the UK MCA detaining the Victoria for a week following an inspection. October 2007 saw Swansea-Cork, and a Kerry based firm both bid to restart the route. News of a second operator being involved broke following the announcement that the Port of Cork had refused a loan of â‚¬3 million to Briar Star (owners of Swansea – Cork Ferries). Unfortunately the vessel that both consortiums were bidding on, Colour Lines’ Christian IV, would not be available until mid-summer at the earliest, due to the delayed delivery of a new building, however it was announced in May 2008 that Colour Line had sold the preferred vessel, Christian IV to Russian interests to restart Helsinki – St Petersburg services. Efforts to find a replacement vessel continued with the launch of a Cork based online campagin in May 2008 to restore the service. In January 2009 another bit was made to bring the former Christian IV to Cork, however a shortfall in funding of â‚¬3 million, and a co-op has been formed to raise the remainding capital to purchase the vessle, which it is planned to renamed the Innisfallen, with the new operators being named Fastnet Line Ltd.